Gustafsson & Sjogren: Scandinavian tradition metallurgical 100%.The truth is that the story of Christmas lasts too little. Last week, Patrik Sjogren wrote me an e-mail. In the text as well as the wishes me was the new clock Nordic Winter Season, his last work carried out as usual with the help of Johan Gustafsson, his partner – professional locksmith expert, according to an old Scandinavian tradition, in arts of cutting and forging of ‘ steel. 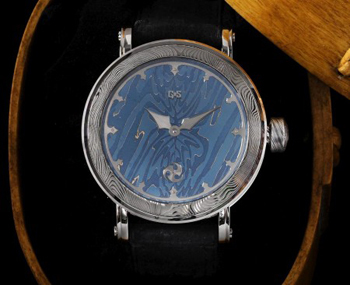 The dial of Gustafsson & Sjogren Nordic Winter Seasons is damascus steel welded and tempered, an ancient technique with which they were built mainly weapons. The one in question was forged by hand by Gustafsson from a single model. In a second stage Sjogren treated surface tempering it and azzurrandolo just enough to get a blue-ice changing. By contrast, and therefore to increase the readability of the hour, the two decided to use the spheres in white gold. Nordic Seasons are the first watches Gustafsson & Sjogren to use the damascus steel for the construction of the box that recapitulates the design of previous models. Johan and Peter have decided to increase the size to 45 mm in diameter to highlight just the damascus steel which also built the bezel, but to improve its fit thickness is now more subtle, and the loops are quite short and tapered. The solid gold hands, which forms resemblance to those of the Sudanese swords, mark the hours on a ring where the indexes will take up the style. As the realization of complex case and bezel, all these details are cut and polished beveled by hand. The strap is in black nubuck. Emerges from the transparent caseback Caliber ETA 6498 (small seconds at 6 o’clock) completely “overwhelmed” by the pair of Swedish craftsmen. Led to the chronometer certification from Soprod, with 3/4 of its bridges that are now forged damascus steel. For the complexity of the processing of said material, and to its use in an environment where obviously the tolerances are almost non-existent, the latter intervention elevates the quality of the product at very high levels. Nordic Winter Seasons is made entirely by hand by two craftsmen who have chosen to tell their story with assistance from the largest and oldest metallurgical tradition of their country. It will be built in just 5 pieces.